Normal skin types. Wonderfully-soothing, herbally-sweet, fruity & floral with spicy-green undertones. This product was designed with the eastern philosophy of prevention in mind; not focusing on the cure, but rather focusing on preventing the sickness by always maintaining good overall health. But occasionally, we take our skin and its perfect bill of health for granted. 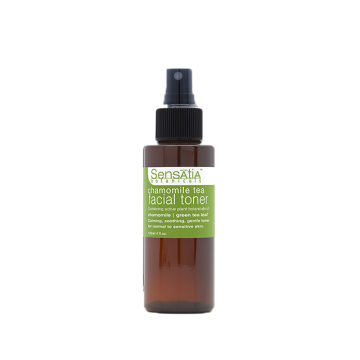 This is why we created Sensatia’s Daily Botanical Facial Hydrate for normal skin types. Carefully blended Jojoba, apricot kernel & wheatgerm carrier oils; plus exquisite essential oils of French Lavender flower, Geranium leaf and Roman Chamomile will not only maintain your gorgeous skin, but will also leave it aromatically irresistible, resulting in a new you that is sexier than ever. For best results use after cleansing; pat face dry; then while still moist & supple, dispense 3 to 6 drops of product into hands, pat on face to evenly distribute product, then massage face in an upward circular motion while of course enjoying the fresh, botanical, aromatic symphony. Leaves your skin perfectly-soft and voluptuous without feeling greasy. Make it part of your daily ritual today. Simmondsia Chinensis (Jojoba) Seed Oil, Prunus Armeniaca (Apricot) Kernel Oil, Triticum Vulgare (Wheat) Germ Oil, Lavandula Angustifolia (Lavender) Oil, Tocopherol (Vitamin E), Pelargonium Graveolens (Geranium) Oil, Anthemis Nobilis (Chamomile) Oil, Rosmarinus Officinalis (Rosemary) Extract. After bathing while skin is still moist & supple; dispense 3 to 6 drops into fingertips, massage into face.